Editor's note: After profiling Christal Presley and her decades-long effort to heal from childhood trauma, CNN asked to accompany her on the second part of her journey: To confront the places that still haunted her. This piece is drawn from the journal Presley kept on that trip. The video above depicts her struggles with PTSD. I feel unexpectedly calm on the drive back to my hometown, Honaker, Virginia, tucked deep in the heart of the Appalachian Mountains. From my house in Atlanta, it's a 6½-hour trip -- but it's also almost two decades in the making. I'm going home to tell my truth. I was 18 when I fled there -- the same age my father was when he was drafted and sent to Vietnam. We both ended up scarred by his war. My father returned home with post-traumatic stress disorder. He spent much of my childhood locked in his room strumming his guitar, moving between the deepest depression and unspeakable rage. Many times, he threatened to kill himself. I learned to tread on delicate ground, doing anything and everything not to provoke him, but this dance caused me to become a profoundly disturbed little girl. I acted out in school, engaged in self-mutilation, and couldn't make friends. When teachers asked how my weekend went, I couldn't fathom answering honestly. I felt my classmates and I inhabited completely different worlds. I didn't know it at the time, but I also was exhibiting symptoms of PTSD. I always dreamed about telling people in Honaker the truth about the way we lived day after day. But my mother was convinced no one would understand, and assured me that only God could help us. She also said if people in our community found out how sick my father was, they might come and take him away. She whispered the words "Vietnam" and "PTSD" on the rare occasions she spoke them at all, a clear indicator that these subjects were never to be mentioned. So we didn't tell a soul, not even our closest family members. And our secret became like a cancer inside me -- a mass that grew bigger and bigger. It would take 31 years and a decade of therapy before I could confront my father about what happened and find some semblance of peace and understanding. In November 2009, I asked if I could call him for 30 days straight to ask him some questions about Vietnam and how it had affected our family. I wanted to know who he was and to figure out what happened to me back then -- and to do these things, I needed to hear my father's story. 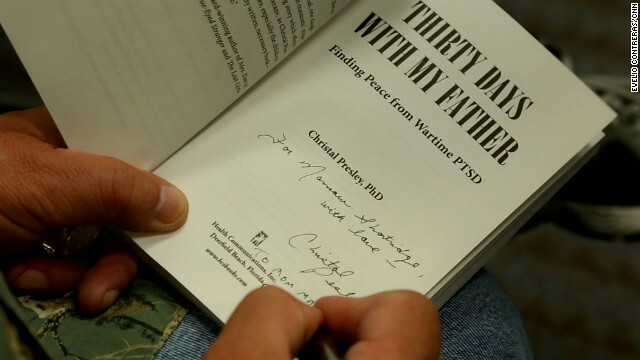 Three years later, I turned our conversations, along with my journal entries during that time, into a book called "Thirty Days with My Father: Finding Peace from Wartime PTSD," published last month. Delmer Presley suffered from post-traumatic stress disorder after serving in Vietnam. The book brought me a lot of closure, and sharing my secret made me feel more at peace. But there was still something missing: I wanted to tell the people in my community the truth -- face to face -- like I had imagined doing as a child. Sharing my story would give me a way to reconnect with people who had known me since I was young -- but who hadn't known the true me at all. I wanted to stand in front of them and tell my truth, and I needed them to hear it. So I am on my way home, to a book signing at Honaker Community Library, having no idea if anyone will actually show up. I've agreed to let a CNN video journalist Evelio Contreras accompany me. As we head north, the flatlands become rolling hills, and by the time we pass Knoxville, Tennessee, mountains loom in the distance. When we reach Virginia, the peaks have closed in around us, and we veer off the interstate to take a series of winding country roads to reach my parents' house. The mountains are on every side of us now. Since my childhood, I'd grown to hate them. I associated the mountains and the entire town with the secrets I was never able to tell. But my calm prevails, and not having flashbacks on the drive home is an encouraging sign. Maybe, I think, I'll be able to revisit several places where I experienced trauma as a child. It's important to me to try to change my negative perceptions. When I finally arrive, my parents come out to the car to welcome me. Mom hugs all over me and tells me I am still her little girl. Dad's perfunctory hug is all I expect. There's a huge spread of food on the table inside, and Mom is asking me if I want 10 things at once, and dad is asking me all about the book. Evelio turns his video camera on, and I start to feel completely overstimulated. I'm exhausted not only from the drive but from a week of radio and TV interviews and book signings. There's been little down time for the past seven days, and it's starting to catch up with me. I ask Dad to play and sing the song he wrote about Vietnam at the book signing tomorrow, and he says no. I can play the CD, he tells me. I didn't expect this. I am hurt -- and angry. I tell him that it's going to look odd if he's at my book signing and I play a CD of him singing when he plays his guitar and sings his song everywhere else in town. Mom chimes in and says my father might not even go to my book signing on Sunday -- that he has told her he isn't going. I am furious. This doesn't even make sense. My father has said he likes the book, and he's selling it to people out of the trunk of his car. I take deep breaths to calm myself. Mom then announces that we all have different sleeping arrangements for the night, and she will be sleeping with me. My heart drops. This morning on the phone she told me I could sleep upstairs and have the whole floor to myself. I need privacy. I need space. I tell her that I love her but want to sleep alone. She puts me in one of the guest bedrooms downstairs. But I'm anything but alone here. I count 33 photographs on the walls and in display cases; 21 of them are of me. There are 20 dolls in the room, their beady glass eyes staring all around. My father's tall wooden gun cabinet stands in the corner, with the head of a lion carved into the top center. The lion's mouth is open, revealing its razor-point teeth. Sixteen guns are inside the case, most of them rifles. I stare at them as I undress and wonder: Which one did he take to the river all those times he threatened to kill himself? I'm up at 6:30 to tend to my dogs, Arthur and Duma. Dad and Mom are awake, and I ask Dad if he'll come to my book signing today. He still will not commit. He hands me two copies of my book to sign— one for a friend and one for Mamaw Presley, my mother's mother. I go back to the guest room and lock myself up for awhile to write. Alone is still where I'm most comfortable. The whole house is overstimulating to me. There is too much furniture, way too many knickknacks, too many pictures, too many porcelain dolls, too many deer heads mounted on the walls. I leave my room when Mom says she wants to show me a comment on Amazon about my book. "Look what this girl in Australia wrote," she says. "She says your book makes her feel normal -- and that all daughters of Vietnam veterans should read it." I smile and feel connected to my mother for an instant. Then the feeling goes away. I put my feet flat on the floor like my therapist has taught me and try to imagine myself connected to the earth. Little Duma jumps into my lap. I practice my breathing exercises as I pet him. I find myself pacing the house. It's hard to sit still. Dad is playing the guitar upstairs -- I can hear it everywhere I go -- and Mom wants me to look at her scrapbook. I want so desperately to want to look at her scrapbook, but I'd rather not. I force myself to look. "Go to sleep little baby. Go to sleep and do not cry. Lay your head on Mommy's shoulder and close your pretty eyes." In an instant, I am transformed into a scared little girl, confused by my father's ever-changing moods and my mother's inability to help him. My mother used to sing this song to me as a child to try to comfort me. It never worked. And what she doesn't realize now is that it brings back the war for me. I see myself in the trailer where we used to live, locked inside my bedroom closet. "Do you remember this song," she wants to know. I desperately want her to stop singing, but I don't have the heart to say so. "Come upstairs and let me show you what I've done with your book," she says, finally. She has created several shadow boxes containing pictures from my book and the book jacket. The boxes hang next to similar shrines holding my father's Army boots and medals from Vietnam. 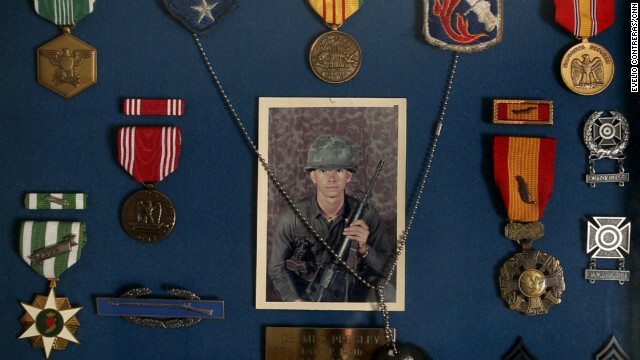 Delmer Presley's medals from Vietnam. I cannot get away from this house fast enough. I tell my mother that Evelio and I have to leave to do some interviews. I've promised myself I'll revisit some familiar sites from my childhood and see how they make me feel. I want to visit three places: the river where my Dad and I used to go fishing (and to which he fled when he felt suicidal), the trailer where I grew up (when my parents sold it, it was moved three miles down the road to another trailer park) and my old high school. I can tell Mom and Dad want to go with us. In fact, they've missed church because they want to spend time with me. But I know I can sort through my emotions better on my own. I feel weepy driving down the curvy mountain road to the river. I haven't seen this place in almost 20 years. My father's been back here, and he assures me the old brick silo is still here. I hold my breath as it comes into view. I don't remember the mountains, the river or the rolling pastures being so picturesque. They were just a normal part of my daily life back then. I also never realized I could look in any direction here and not see a single house. There's a fence around the pasture now; the cattle can no longer just make their way at leisure from one side of the road to the other. I crawl over a bridge guardrail and walk into the pasture. I remember the exact spot where my father and I used to fish. I think about the day he saved the life of a fish I caught. I was trying to free the fish but couldn't get the hook out of its mouth. It began to die in my hands, blood flowing from its gills. My father quickly cut the line, assuring me the hook would dissolve in the fish's mouth in time. He held the fish underneath a waterfall (so it could get more oxygen, he said) until it was jumping with life again. Then he released it into the water. It's nice to be here again, to look at the waterfall and the silo in the distance and remember this place in a positive light. I can still see my father and me back then. I'm 7, and he is a young man in his late 30s, just a few years older than I am today. This place feels so peaceful. For so many years, the only thing I associated it with was my father, his gun and fears we would never see him again. If I were feeling depressed or anxious, this is the kind of place I'd seek out, where I could be at one with nature. I've never thought of this before, but maybe this place saved my father's life. I drove past our old trailer in Honaker two years ago and snapped a picture. I wanted to show my colleagues in Atlanta where I used to live. But that's the only time I've seen it since I was 12, when my parents built the house they live in now and we watched the trailer roll away. It jars me when I see it again. My heart races, and I take deep breaths as I park my car at the bottom of the hill. The trailer is painted in almost exactly the same colors I remember -- blue, brown and white -- and has a wooden roof atop the thin metal one I remember. I have it in mind that I'll walk around the perimeter of the property and take some pictures. Just to be polite, I knock on the door before snooping around. I can hear movement inside, but it takes the person a long time to get to the door. When the door finally opens, a large man in an electric wheelchair introduces himself as Grover Lambert. I don't plan to do this, but I find myself suddenly asking if I can come in. "I used to live in this trailer," I tell him. "My parents are Judy and Delmer Presley." Grover remembers them, and he remembers me. He bought the trailer when I was just a kid. He keeps asking me how old I am, in disbelief that I'm 34. "I remember you as a little kid about this big," he says, raising his hand about 3 feet off the floor. I explore the trailer and find not much has changed. Even the wallpaper in some of the rooms is the same. It feels so claustrophobic. It's hard to believe three people ever lived together in this place. There's new carpet, and Grover has replaced the kitchen counters. There's a stench of sweat and medicine. I ask Grover if he reads much, because I want to thank him by giving him a copy of my book. I am stupefied by his response. "I can't read," he says, looking down to avoid eye contact. "I never did get much education." It's hard for me to look at him. I feel embarrassed that I asked, and so sorry for him, too. I don't know what I'd do without books and stories. They've saved my life in many ways. I look around the trailer -- and at Grover -- and all I can think is that this could have been me. I feel guilty that I was able to save myself, to get out of this town when so many others couldn't. Christal Presley tears up when she walks inside the trailer where she used to live as a child. Part of me wants to run away from this place as fast as I can, but I can't leave without seeing my old bedroom. It's chilly in the trailer, but as I wrap my fingers around the doorknob, I notice my palms are soaked with sweat. As I open the door, I am shocked the room is so small. There's a full bed and not much else. I fixate on the little closet in the back of the room. It is the place where I hid from my father. For hours a day sometimes, I read and wrote by flashlight there, hidden away from the world. It was the one place I felt safe. I start to cry. I can't stop. I think about running over to the closet, flinging the door open and ordering my childhood self to come out. But I don't. I leave the closet door shut and stare from a distance. I feel disconnected when we drive into the high school parking lot. It doesn't seem like I ever even went to school here. That's no surprise. I was disconnected from everyone during my teenage years. I was in countdown mode until I could leave Honaker. I look at my watch and realize I have only two hours until I'll be speaking and signing books. I have no idea what I'm going to read or what I'm going to say. I've hardly seen anyone but family here for almost 20 years. A part of me would like to think no one in Honaker has changed; I remember most of the people here the way they looked two decades ago. Maybe I'm afraid of seeing that change. Dad calls and says he'll play his song about Vietnam after all, but he has to set up sound equipment at the library. I'm relieved -- and nervous. I've done a lot of interviews and frequent readings of the book these days, but not in front of my parents. Not in front of my family. Not in front of people in Honaker. We return to my parents' house. I need some time to think before the event at the library. But as soon as we walk into the house, Mom starts handing me books to sign for friends and relatives. She also shows me a T-shirt she's been wearing with "Thirty Days with My Father" ironed onto it. She's laminated a picture of the book's cover, too, and plans to put it in her car window. Dad keeps calling my name from the other room. "Christal. Hey, Christal," he yells over and over. I finally yell back that I am talking to Mom and cannot have two conversations at once. I feel completely smothered. When my mother's leg brushes against mine at the table, I pull away. I don't want to be touched right now. I want to be alone. I start counting the hours until I can return to Atlanta. I lock myself in the guest room and try to figure out what I'll read and say in front of my community today. Maybe no one will show up. I'm afraid they won't. I'm afraid they will. My heart pounds on the way to Honaker Community Library. The air feels heavy. I've decided the only way I can get through this reading without sobbing is to use a script. Luckily, I have the one from my book launch. The first person I meet at the library is a friend of my parents. She tells me she's the widow of a Vietnam veteran; her husband died several years ago of complications from Agent Orange. The second person I meet introduces himself as a Vietnam veteran. He has tears in his eyes. "If you can help even one person understand what we went through, all this will be worth it," he says. "I'm buying your book for my two children." My mother has agreed to sell books for me, so she sets up on the side of the room, and I walk to the table in front where there is a chair waiting for me. In no time the room is packed. Although I was a bundle of nerves when I walked in, I feel myself relax with each person I meet: old friends from church and from high school, neighbors, friends of my parents, people I've never met. I was worried about the mere act of being among the people of Honaker. After all, I'd lied to them for so long. For many years, I'd imagined myself standing up in public (usually my fantasy happened in a church) and finally flinging open the doors of truth, telling all of Honaker about the way my family lived. The depression, the rage. My father hiding in his room, me hiding in my closet. But I'd kept to myself the daily repercussions of the war that raged inside our home. Now every single person I talk to thanks me for writing this book. "We're proud of you," they say. Their words give me strength. By 2:40, I am feeling more confident. There's standing room only. All 30-plus chairs are taken, and people keep coming in. When I move over to the podium, I'm not terrified like I thought I'd be. I look out into the audience. Not a single person is frowning. I can feel their support, their love. It is amazing to me that these are the very people I've avoided for almost 20 years. I was afraid that if they knew the truth about my family and me, they'd ostracize us. I was so afraid our reputation in the community and the church would be ruined -- and that no one really cared about us. Yet here they all are, people who clearly care enough about my family and me to come today, and who obviously care about this story. Before I start speaking, I think about how ironic it is that for 30 years I never gave my father a chance to tell his story. Once I did, we both found peace and healing. In truth, I've never really given my childhood community a chance either. I've assumed the worst of people because of my own fears. I begin to speak -- not from my script, but from my heart. I tell them that I'm scared, that I didn't know how this would be, how frightened my mother and I were to tell the truth and it just about ate us alive inside. I tell them that what happened back then -- and the way my family dealt with it -- prevented me from having relationships with everyone in this room. I say I hope things will be different now. I look into the eyes of everyone in my audience, and I know it will be so. I move on to my script, and I read the prologue of my book. There are lots of questions afterward, and I can see people in the audience crying. Delmer Presley signs his daughter's book at the Honaker Community Library. My father sings his song about Vietnam, and people gather around for me to sign their books. Most ask my father to sign, too, and I just sit back and watch and smile. My father deserves this. Perhaps it's the welcome home from Vietnam that he never had. It feels like the welcome home I've always wanted, too. I'm quiet on the long drive back to Atlanta, deep in self-reflection. I've reconnected with my community, and I'm happy about that. A story is nothing without an audience, and people showed up to hear mine. Mostly, though, I'm glad to be going back to Atlanta. It is a vibrant cultural epicenter, teaming with people from all backgrounds and walks of life, and I have flourished in this diversity. My mind is open now, and there's no closing it. I may always call Honaker "home," but Atlanta has become my home, too. It's where my friends are, where I can build a quiet life in my own little house, and where I can wake up every morning to my chickens, my dogs and my garden. I have a piece of the country here with me, but I don't have to be constantly exposed to things that remind me of the war. It is such a peaceful feeling to know that in a few hours I'll be back in Georgia's capital city, a place where I have grown to feel completely safe. As the miles tick by, I think about Grover Lambert and the many other people in Honaker who never had the opportunities I did. My parents had no money for college, but I was able to attend for free because of my father's PTSD disability. It was my ticket out of Honaker. I knew, even at a young age, that I had to leave behind the landscape and the people who triggered my PTSD. I had to start over on my own. I wanted to live. As we leave the mountains behind and near Tennessee, I think about the old deer heads mounted on my parents' walls. They're the only décor left from when we lived in the trailer. Those deer heads have seen it all. And like my family, for years and years, they stood silent. Writer Leroy Brownlow once said, "There are times when silence has the loudest voice." I believe that. For 30 years, silence was my default mechanism. It almost killed me. Talking to my father about the war broke a pattern my family probably would have held until the end. 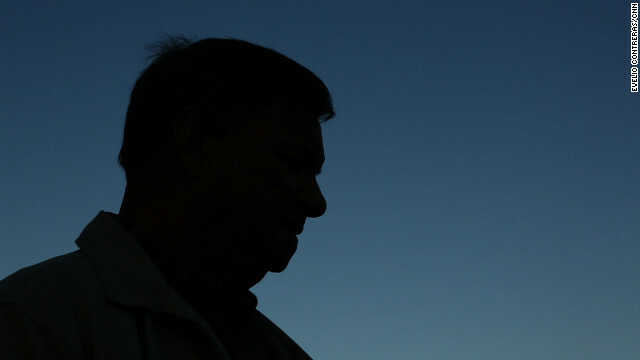 Publishing "Thirty Days with My Father" was a way to ensure I was never silent again, even long after I'm gone. Finally looking my community in the eyes and telling them the truth about my life was a way to make sure my family no longer has to carry our burden alone. There are still times when I wish I had a different story to tell. There are still times when I dream of the childhood I wished I had, and times when I look at pictures of my father in Vietnam and want to warn him, "Go to Canada, Delmer. Don't go to Vietnam. You will never be the same. You'll hurt your wife and daughter. You won't mean to, but you will." More and more these days, though, I accept the life I was given, and find solace in helping others tell their truths by sharing mine. It seems like the only thing to do -- the right thing to do -- and something that will continue to set me free. I will no longer be silent. This I know. Christal Presley grew up in Honaker, Virginia, and received her bachelor's and master's degrees at Virginia Tech. She earned her Ph.D in education from Capella University. "Thirty Days with My Father: Finding Peace from Wartime PTSD," published by Health Communications, Inc., is her first book. She lives in Atlanta, where in her spare time she plays with her dogs and tends to her chickens and garden. To learn more about Christal or her book, visit www.christalpresley.com.